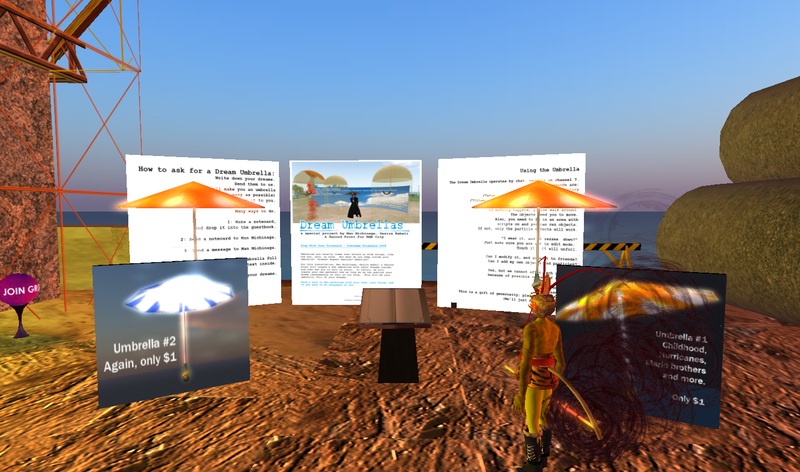 Promoting and developing highly interactive online exhibition for contemporary art, presenting varied types of artworks in “Land of Illusion” in Second Life, therefore challenging existing formats of art exhibitions. 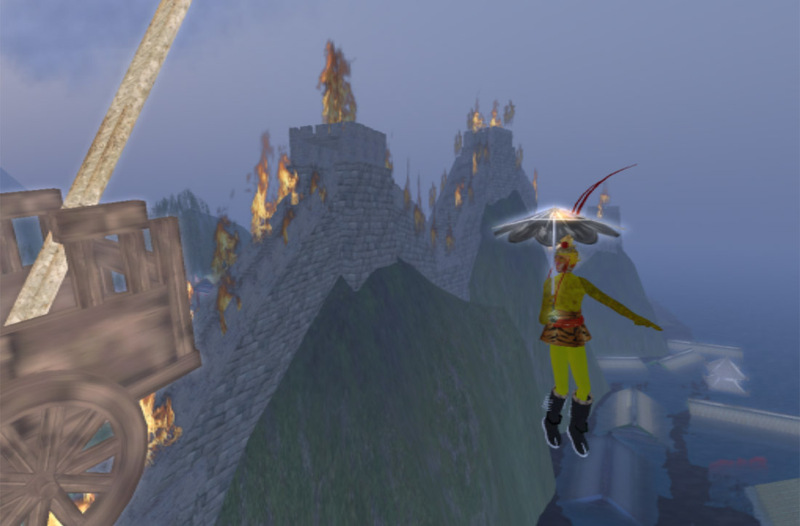 Creating new art vocabulary in “Land of Illusion” in virtual world, which utilizes digital multimedia, online performances, virtual sculptures and traditional fine arts language. Contributing to artist community building with communication technology in the Internet age, enhancing global artist collaborations, stressing on audience/artist or artwork interactions, meanwhile emphasizing education and cultural exchange functions. 1st month: Adjusting “Land of Illusion” in Second Life for future presentations of contemporary arts, set up Website, blog and launch “Contemporary Art Center” project. 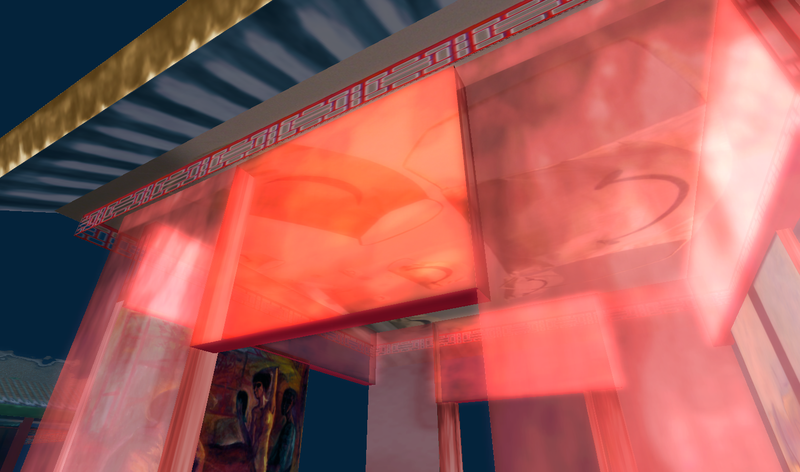 2nd – 9th month:Hosting a series of contemporary art exhibitions，including inviting the most active artist groups in Second Life for virtual world performances and installation, sculpture and multimedia presentations. 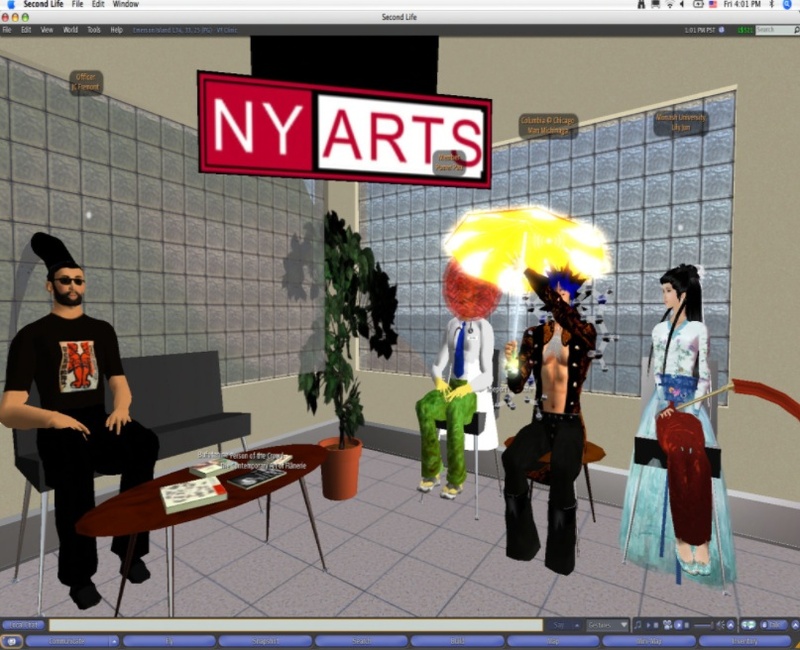 Collaborate on publications and reviews with major global new media art organizations. 10th – 12th month：Hosting Cyberart & Education Festival, that aims to encourage younger generations to explore cyberspace as a creative and collaborative place, meanwhile highlighting educators’ innovative project using virtual world applications for teaching art & design. Collaborating with new media art institutions on publications. whose fruits and who can enjoy? Monkey travels to heaven to demand recognition of his new found power. There he finds seven fairies preparing a banquet for the birthday of the Queen Mother of Heaven. Incensed that he has not been invited, he begins to eat the Queen Mother’s magical heavenly peaches, and fights off each of her divine guests who try to prevent this. The Queen Mother then calls upon Buddha to deal with Monkey. When he returned to Flower Fruit Mountain after leaving his post as Bi Ma Wen, two single-horned demon kings came to him and suggested that he take the title of Great Sage Equal of Heaven. Wu Kong was very receptive of this idea and called himself by that title from then on. Afterwards, when he defeated all the Heavenly generals sent to capture him, the Jade Emperor (ruler of Heaven) gave him the post of Great Sage Equal of Heaven to placate. It was, of course, an empty post with no work for Wu Kong to do. 如意金箍棒 is pronounced as Ruyi Jingu Bang, literally meaning “As-you-will Golden-bound Cudgel”, is the poetic name of a magical weapon wielded by the Monkey King in the classic Chinese novel Journey to the West. rather than changing sizes, varied patterns are emitted from the rod - as I wish! It is an iron rod whose size changes “as-one-wishes”, once used by Da Yu to measure the depth of the flood waters destroying ancient China, which Wukong obtains from the undersea palace of Ao Guang, the Dragon King of the East Sea. It is immensely heavy; in modern measurements, it is slightly weightier than 7.5 metric tons. When it is not in use, Wukong shrinks it to the size of a sewing needle and keeps it behind his ear. It is often depicted as red and having gold bands near the ends. In other depictions, it is shown as a silver staff with golden ends, or as a solid gold or copper staff. In some forms of the legend Journey to the West, Ao Guang is shown to have believed that the cudgel was hardly worth anything, until Wukong commanded it to both shrink and grow, showing its extreme worth to his dismay, because he did not particularly like Wukong. Rebellion against Heaven is one of the most popular animated films when I was a kid. It was adopted from Journey to the West as a propaganda program convincing people that “rebelling is reasonable.” It’s a beautiful film with visual style mimicking colorful Chinese woodcut print, and the exciting narrative based on the Chinese classical. All children love Monkey King, and admire his power with “72 transformations” that defeated generals and army from heaven, especially the unbeatable “as-one-wishes” rod, which perhaps symbolizes his “revolutionary spirit.” I guess all of these have moved me deeply, that I decide to make a new machinima covering “climbing cloud ladder to reach heaven” and “rebellion at heavenly Peach banquet.” Former was completed on Jan. 31.2009. 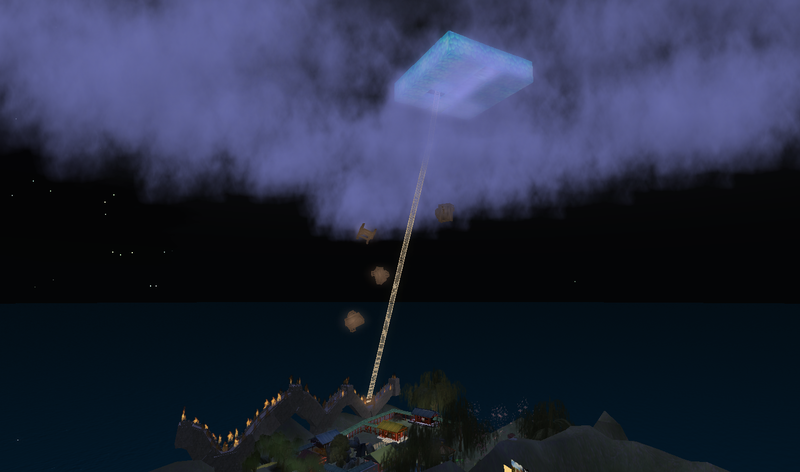 As for the latter, I built a “water cube” (the swimming stadium in 2008 Beijing Olympic Game) suspending right over the “cloud ladder” with a banquet inside; then myself has been transformed to Monkey King, the owner of “as-one-wishes” rod, which starts the stories. Last week I was in half way building “drifting inspirations”(adopt Qu-Shui-Liu-Shang drink game in ancient China) disseminating recluse culture of China. Peach Blossom Shangri-la was the title by then. I thought it’s important to use “Shangri-la” because the work is interpreting independence and solitude. Things went smoothly with filming on Winter Blossom Dance and Monument ’08 – climbing and falling. Then I started worrying a little that the theme appears too aloft to be understood by audience. At this point, Honglei came to talk about his research on folk opera about Monkey King, and how this could be a perfect theme discussing religion and values lost during globalization and economic development of China. What a backward since ’89! Does the openness only mean being slaves for the global market, or showing off their vanity? and their belief and confidence resulted by the economic success have led them to extend ambitions in some dangerous directions… Yet we don’t want to see riot, “I just hope the country is alright, not too good neither too bad, so others will leave it alone.” Honglei said. I agree. And I signed 08 Charter. It’s alright. The shoe missed the goal again. It’s not a bad thing to know that many “(con)temporary Chinese artists” are thinking of new occupations under the stress of financial crisis. Yes, things are changing. One of my blogs needs to be closed, because I don’t care a “public service;” then it’ll be merged into my personal blog, for making voices in a more real and enjoyable way. Same to my teaching – I declined an offer in Boston, simply consider it’s worth nothing to my creative self. We’re moving to NYC, where I will be a recluse again. People come to suggest, hey Lily let’s collaborate on something about new media, it’ll be exciting… no, it’s in fact boring. We all get a point that technology has become so sophisticated that any artist can use computer to produce work, and not bothered by much coding. When technology is advancing, it becomes more unnoticeable, naturally taking part of artistic creativity. “Science and art” likely begin breaking apart again, relatively I mean. They’ll walk on their own track as usual. I don’t believe most scientists can be artists as well, vise versa. And I promise you academia will pull you back as an artist – you think anyone can teach you to be creative? Coding won’t help. It’s simply not the way resulting great art. It was an exciting concept or motivation barely fruiting, mainly because science is dominant in this trend which results conservative work in terms of getting in touch with our innermost feelings. Ha! Clearly I’m out of the cage already, saying something that I believe – learn from the real life rather in lab or studio! And if you are a real artist, nothing can stop you. If you are driven by profit, it’s a bad time. Don’t show me your project only with empty big names and work with big budget, that proves you can’t see anything through your own eyes. Have you seen Rikoko’s dairy? 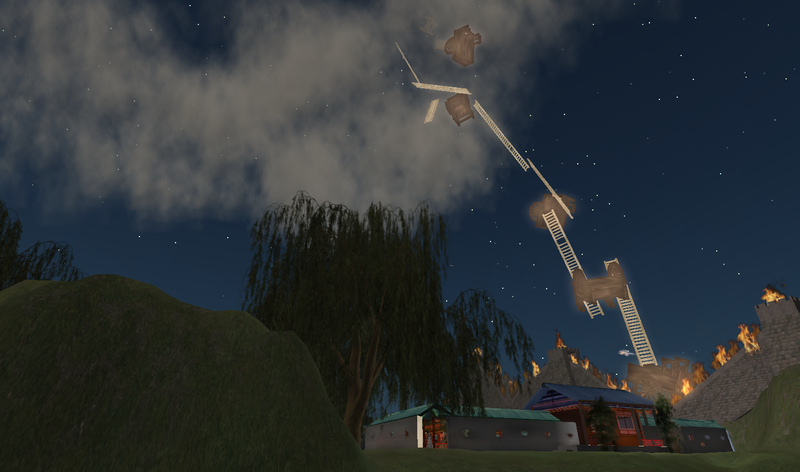 The Japanese girl’s journey in Second Life is admirable for its freedom, beauty, independence and loneliness! You may argue it’s something else than contemporary art. Who cares. 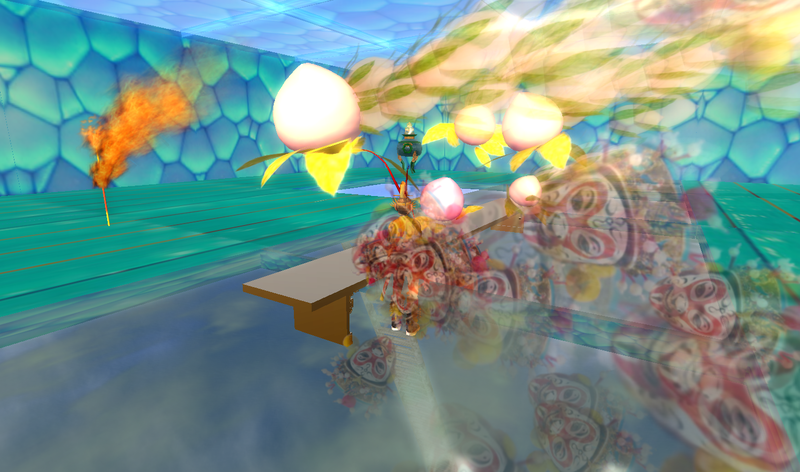 Taking Honglei’s suggestion about Monkey King distroying “heavenly peach banquet” instead of yinshi (recluse) in Peach Blossom Shangri-la this time, I set the background at Water Cube of Olympics 2008, and truly feel the rebelling Monkey is waking in my soul. It’s in fact the point we are going to organize a SL presentation for Boston Cyberarts. UMass design gallery provides professional setting up for new media work. I’ll need to test the Internet speed for live SL performance. If impossible, still we can show machinimas based on a few sites with intriguing inputs. I’m adding a map directing visitors to these stops: Land of Illusion (lily & honglei), Arena (upbar), a place for “dream umbrella”(patrick). Those sites/artists alway have some new work to show. Their latest experiments are exciting. After a conversation with Patrick, I paid a visit in RMB city People’s Worksite, as I first saw “dream umbrella” there. Luckily Patrick was online and responded my request with a cutely designed lady’s umbrella. I like the whole idea that once you type in “/7show”, the list of available items appear, then type /7xxxx, one expects image or object to be emitted, while the umbrella tells the dream related to the item…. I adopt the script from “Dream Umbrella” (Patrick Lichty or Man Michinaga) to make my “as-one-wishes” rod. It’s fine as long as you’re not selling them. 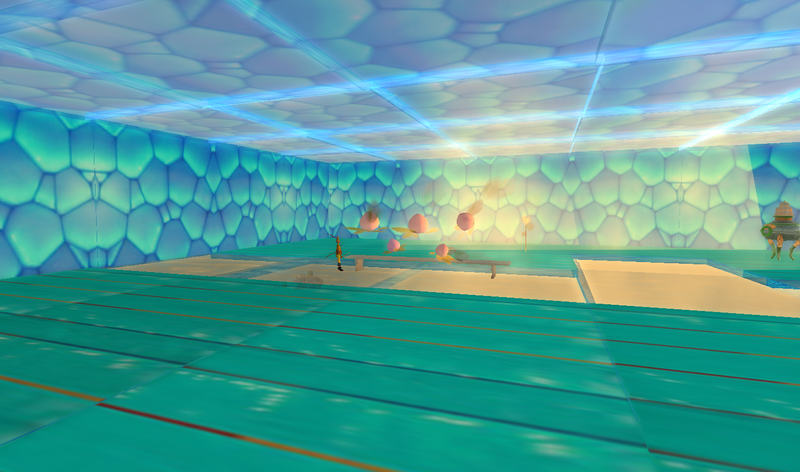 The script image/object emission is actually not new in SL and can be seen in many locations. Opening: 8PM EST or 5PM SLT Jan.30, 2009, reception with live dance performance Winter Blossom by Story House group. 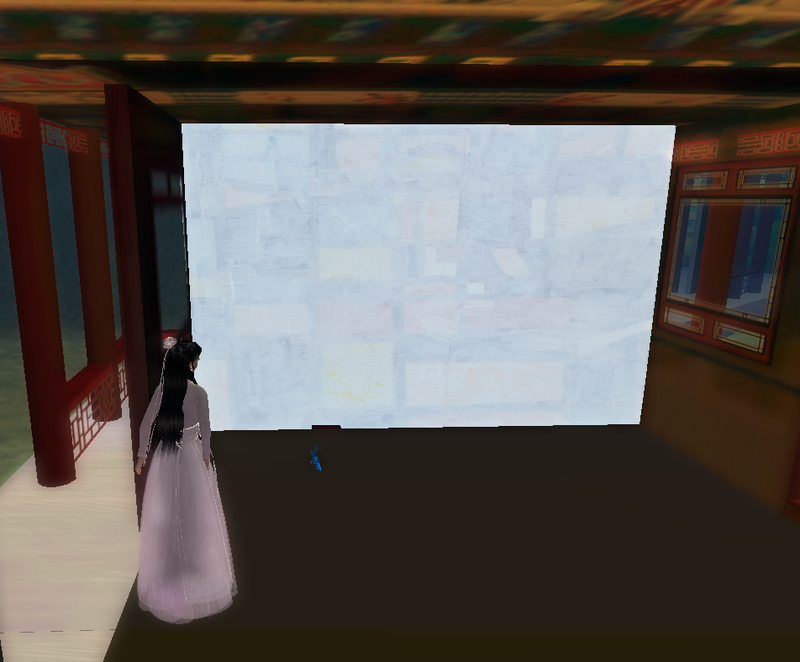 Monument ’08: Lily & Honglei, the new media artist team from Beijing, invites you to experience a unique installation exhibition in Second Life – “Monument ’08,” during the first month of Chinese Ox year. Monument ’08 is designed as a visual meditation upon the past and the new year. 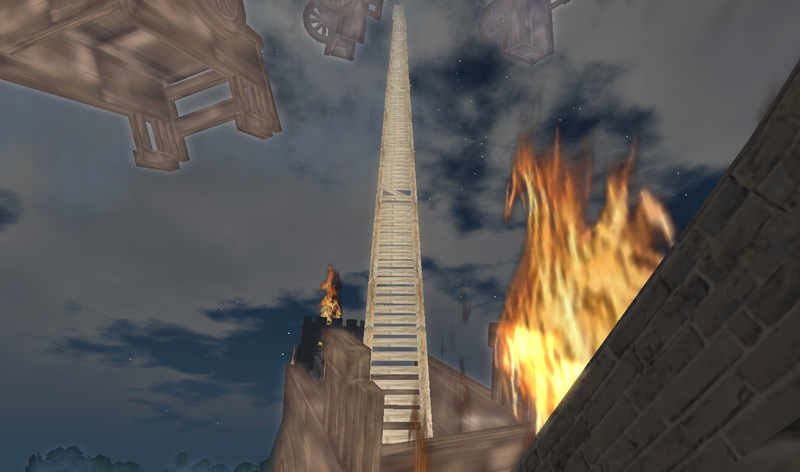 Using link provided, audience will find themselves immediately standing inside a giant ancient China’s chariot on the Great Fire Wall, and facing an endless long ladder leading to the heaven. Here, the symbolism is obvious: a Confucius’ chariot implies striving in society and hoping to change the world with their idealistic principles, and persistently follow the footprint of Confucius who “knows the impracticable nature of the time, and yet will be doing them.” The ladder in folk culture usually symbolizes high social status. Audiences are suggested to start from the chariot to “climb up – but be careful! ” one may fall from the clouds down to the ground any second! But not too bad – audience might land down around an underwater “Crystal Palace,” another part of this virtual installation consisting of relics of a heritage site mimicing the Three Georges Dams area, with scattered paintings and digitized Chinese cutting paper, that allow visitors to take copies with them as a “souvenir.” Or, they might land on the other site in “Land of Illusion,” a Chinese court yard and garden indicating the correlative cosmology, and inviting you to access your inner garden. note: Upgrade! Boston is a monthly gathering of artists, curators and the public that fosters dialogue and creates opportunities for collaboration within the new media community. Hosted by the Studio for Interrelated Media at Massachusetts College of Art and Design, each meeting consists of one or two hour-long presentations interspersed with questions and comments from the audience. Theme-based panel discussions are organized once or twice a year. The events are informal, free, and open to all. Founded by Turbulence.org in January 2005, Upgrade! Boston continues to grow as a local node within the global Upgrade! International (UI) network. Exhibition Dates: February 15 – 28, 2009, Tues – Sat 10: – 6:00 pm. 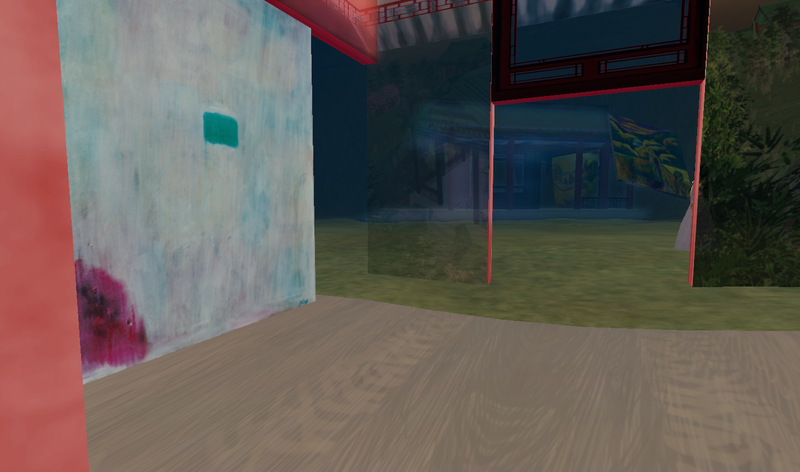 Exhibition Description: the exhibition explores virtual world art as a form of assessment of globalization, a venue to explore Internet-based virtual world as a Modernist techno-libertarian utopia, a political utopia, and “reality” of the dream world. The exhibition also serves as part of initiative of a new platform promoting net-art by presenting work in this field not only on Internet but in galleries in both New York City and Beijing.